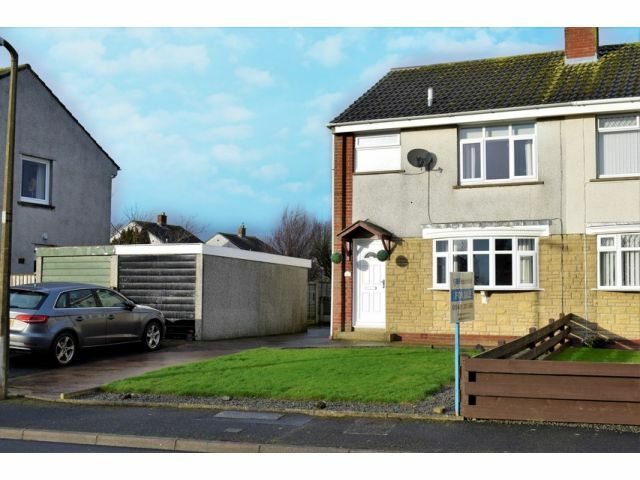 Located in the popular township of Gretna, which has amenities including shops and schooling and is ideally situated for access to the M74 North & South. Providing an open plan Lounge and Dining Area with French doors leading to a large Conservatory, Kitchen with generous Storage Cupboard. Three Bedrooms (one with a built in wardrobe) and modern Bathroom. Outside there is driveway parking and a detached garage to the front and a large rear garden with lawn and patio areas, perfect for families. Ceiling light, radiator, carpeted flooring. Double glazed. Radiator, laminate flooring. Doors to rear garden. Window to rear. Coving, ceiling light, large storage cupboard. Range of fitted wall and base cabinets with recessed lighting over sink area. Integral oven, four ring gas hob and cooker hood extractor. Stainless steel sink and drainer with mixer tap, plumbing for washing machine. Space for fridge freezer. Tiled splashback. Radiator, vinyl flooring. Door to outside. Window to side. Loft access, ceiling light. Carpeted flooring. Window to front with blinds. Ceiling light, TV point, large built in wardrobe. Radiator, carpeted flooring. Window to rear. Ceiling light, radiator, carpeted flooring. Opaque window to front. One x four spotlight, full Perspex boarding. Three piece suite comprising of toilet and wash hand basin set into vanity unit and bath with over head mixer shower and waterfall shower head. Driveway and detached garage. Lawn area to front. Low maintenance area to side and large rear garden with lawn and patio sections.